Saturday was hot and humid, with just enough stillness in the air to thoroughly test drive the sweat glands for the first time this year. Good news is they still work just fine. 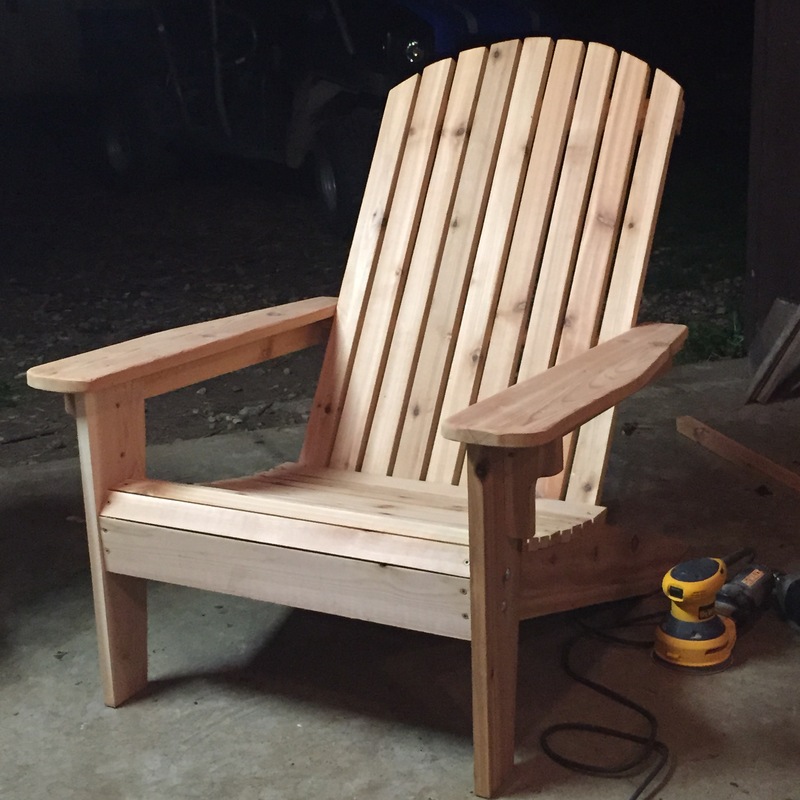 I spent quality time in the cool of the carriage barn workshop using one of Hank’s old chairs as a template for a set of new Adirondacks for both Alison and my mom. There are a lot of reasons why I am an unqualified chairmaker. My maternal grandfather was an accomplished carpenter, back in the days when men fixed their own cars, shined their own shoes, and built their own houses. In the days before power tools, when it took muscle and sweat to saw a board. But I have learned the hard way that those carpentry gifts aren’t hereditary. They are learned, one painstaking mistake after another. Good news is I’m trying, moving slowly up the curve – with the emphasis on ‘slowly’ – one project at a time. I’m also a terrible judge of comfort. After an intense farm work day, when every last ounce of sweat has finally been coaxed out of my surrendering body, almost any piece of furniture will do. In fact, I typically forego furniture and opt instead to sprawl out on the cool wood floor, just beneath the ceiling fan in the front room of the house. In those moments I would happily curl up on a felled bed of Saguaro cactus. It’s relative comfort I seek. But to make it big in the furniture world you need to have a working knowledge of absolute comfort. The older boys helped on the chairs, taking turns drilling and sanding and cutting. It’s a good way to spend time together. They are learning something. Some may call it re-skilling, but we’ve never really had the skills to begin with. To us it’s just plain skilling. Late in the day, my Mother’s Day deadline fast approaching, I ran over to Hank’s Hardware for a better tool to drill pocket holes into the back of the chair. Carolyn heard me coming. “You finished with the chair for your Ma yet?” she called out from the garden. Like the firefighters’ annual chicken broil fundraiser or the latest millage proposal, my attempt to make a chair is something worthy of community support and inquiry. Hank was just about to close up for the day. He usually does so around 5 or 6, though cold, wet weather sometimes stokes the arthritis and prompts a 2 o’clock closing. It just depends. The Saturday sunshine though kept his doors open longer and I was able to sneak in. As I suspected, Hank had three of what I was looking for. We tested the tool and technique on a piece of scrap lumber. My untrained hand slipped, and the sharp edge caught the fleshy meat of my palm heel, tearing a paper-hole-punch-sized hole just below my thumb. Blood oozed out. I paused a moment to inventory it. Hank was impatient. We do that to ourselves too. Unable to stand back and enjoy the relative beauty in our lives, we instead obsess over the relatively microscopic flaws and regrets. We worry about the kids, our occupations, our place in this world, how we stack up. In the age of filtered photo sharing sites, it’s hard not to. But I’m for treating these farm days like prototypes, every last one. Small victories, new skills, large defeats, sweaty shirts, rough edges, borrowed tools, minor hand injuries. Give it your best shot, lay on the floor awhile, hobble upstairs, shower off the grime, knock off instantly. Then wake up the next day and build another one even better than the last. My life philosophy in a nutshell. Farm days are the best! Beautiful chair! My husband has been making wooden trucks and tractors for our boys and he is just as critical of them as you describe. Seeing the joy on their faces and, especially, when they wanted to sleep with the toys, convinced him that maybe he really had accomplished what he intended. Thanks for the post! I always breath deeper upon visiting your farm days through your vivid writing. Thank you for taking the time to share!